My husband and I could not be happier with the wonderful contribution that Cameron made to our rose garden wedding this past July in La Canada-Flintridge, California! We were in contact with Cameron for a few months before the wedding, and he was extremely helpful during every step of the process. He very kindly prepared beautiful arrangements of several songs that were meaningful to us, and he also played numerous classical and pop songs from his stellar repertoire list. His performances during our wedding rehearsal, ceremony, and cocktail hour were flawless. 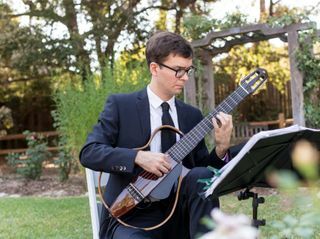 Numerous guests made comments about how excellent our musician was, and we would wholeheartedly recommend him to anyone considering hiring a classical guitarist for their wedding or other special event-- he is absolutely the best! Cameron was extremely professional, flexible, responsive, and very easy to work with, and his prices were extremely reasonable and his quality of musicianship and service excellent. Thank you, Cameron, for contributing such beautiful music to our wedding! We were incredibly fortunate to have Cameron provide the music for our wedding ceremony - he was amazing! We selected a mix of classical and contemporary arrangements, and the music set the perfect tone for our wedding. Cameron could not have been more accommodating or professional; I cannot recommend him enough! Cameron performed brilliantly and his musicianship was on display for all of our guests. His professionalism was much appreciated, from his early coordination and prompt email communication to the ease and no-fuss manner with which he blended into the details of our ceremony. He did a fantastic job arranging and performing a meaningful song for me and my wife, and he really made our event special. Cameron played guitar for our ceremony, and was wonderful. As a nervous bride, he provided exactly the kind of music I needed to soothe me down the aisle! Aside from his out-of-this-world musicianship, he was extremely professional, responding in record time to all of our questions! He made sure to understand all the logistics of the venue and ceremony well in advance, so the music would go down without a hitch. He was more prepared for the big day than I was! He was very flexible to our musical choices. 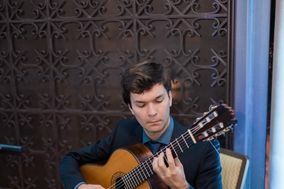 If a selection didn’t exist for classical guitar, he would arrange one for a very reasonable fee. We wanted an eclectic mix of tunes for our prelude, so this talent of his came in quite handy. I would recommend Cameron to anyone!